Can You Learn the Alexander Technique in a Short Introductory Course or Workshop? Introductory Workshops and Courses are very useful learning resources but it is important for anyone who is interested in attending one of these to remember that they really are only introductory! This may seem like a tautology but some people still seem to hope that they will be able to learn all they need from a few group sessions. Sadly, this is not possible. Some very valuable learning can take place in Small Group Courses, they are a cheaper way to begin learning the Technique and they can be fun as well. Providing the pupils have some 1:1 lessons, these Introductory Courses and Workshops can offer a taste of Alexander work and even add something that is not possible to experience in individual lessons - so I believe Introductory Courses can offer something very worthwhile. However the main learning of the Alexander Technique necessarily takes place in 1:1 lessons because this is the standard and best way - and many teachers would argue that individual classes are the only real way, to learn the Technique. The results of the ATEAM research into low back pain show that the most effective method of helping people with low back pain is to take 1:1 Alexander Technique lessons with a STAT registered teacher. Dr Miriam Wohl (Statnews Jan '08) goes as far as stating that she believes that group courses of six or more beginners, if they do not include individual lessons, merely short-change the participants and do both the Alexander Technique and the beginners, a disservice. Whilst I agree that individual lessons are central to a person's ability to learn the Technique and that it is important that beginners realise this, I would argue that groups do have a useful role to play. 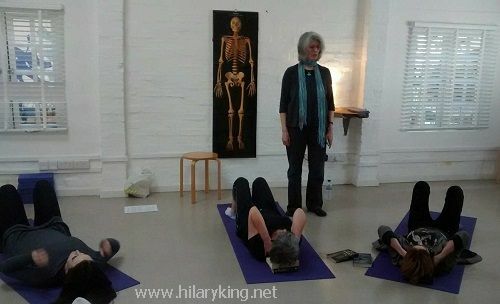 'unless people actually have the experience that it is possible to give in the lesson - in the one-to-one situation - they will not understand this vital point of the unity between mind and body... Group work has its tremendous uses and values... but you mustn't overlook the fact that the Technique certainly can't be taught by group work alone'. It is for this reason that all participants of the Introductory Courses and Workshops that I run, are always encouraged to experience the Technique in an individual lesson and to see it as part of the course. I either include a private lesson in the course fee, or make an optional lesson available at a reduced rate. In this way pupils can understand the difference between what they have learned on the course and the greater depth and range of work that is only possible during individual lessons. Sometimes people are quite surprised to find out just how much more they can learn, when they have my undivided attention. However, some people can feel somewhat isolated if they only have 1:1 lessons and do not know anyone else learning and using the AT in their daily activities, with whom they can share their experiences and widen their understanding of AT work. Small Group work can offer people a chance to make social connections with other AT pupils. Why Are Individual Alexander Technique Lessons so Important? We each have our own personal way of using our bodies, through which we express our thoughts and feelings as we act in the world and it is decidedly easier to address those individual traits in 1:1 lessons. In a group situation, what the teacher says to one pupil about her body-use, may also be helpful for someone else - but it may be quite wrong for another person and very unhelpful for that pupil to take those suggestions on board. In private lessons our individual issues may be addressed more directly, without such confusion. Our mind and body work as one unit and we develop habitual patterns of psychophysical use over a long period of time. Some of these habits are unhelpful to us, resulting in minor problems such as poor co-ordination, a lack of poise or perhaps something hard to define, such as a person just not feeling 'right' in their body. Some of our habits contribute to, or cause, more serious conditions such as chronic back pain and RSI. We often don't know we have to change something about the way we use and express ourselves in the world, until we experience the warning signals of pain. Pain is a good teacher! Of course there are similarities to be seen in the various ways that people use their bodies and express themselves but we all have our unique habit patterns of use and mis-use. Many of these habits are subtle and are, at best, only semi-conscious. We are often not aware of them until an Alexander teacher draws our attention to them, so it is very difficult to stop habits and change the way we use ourselves on our own. In an individual lesson the teacher's hands guide the pupil's movements, making gentle re-adjustments and the teacher may link the pupil's attitudes and thought patterns to their body-use. In this way the teacher can highlight our habits moment by moment, as they take place, and so help us stop any mis-use that interferes with the way we function. For instance, if a pupil has been told throughout their life to 'try harder', they may well tense up at the very thought of making an action, particularly if the movement holds some importance to that person. Just trying to relax will not work nearly as well as recognising the link between the thought 'I must try harder' and the perceived need to express this by tightening up. Once this link has been made the pupil can begin to choose not to react to that and other internal messages with tension. In this way we can become free to find a different, conscious, way of using ourselves as we perform our daily activities. This process of change can take place in 1:1 lessons, in a way that would be unlikely to happen in a group situation. Importantly, pupils also learn how to maintain those changes during their daily lives, outside lessons. In this way, we can each learn to take responsibility for our own use rather than just wait for someone else to try to 'fix' things for us. I believe Small Group Alexander Technique classes play a valuable role by offering participants the chance to find out about the Technique in a safe, friendly environment at a reduced cost. This means people can test the ground. I have known a number of people who, even if they can't immediately have 1:1 lessons after the end of a course, come back to me for individual lessons a couple of years later, when they are financially more secure and they feel ready to work on themselves by learning the AT. Courses and Workshops can also offer something that is not possible to do in an individual lessons, for course participants can learn from other people as well as from the teacher, through discussion, sharing experiences and observing the way they all use their bodies. This can help them recognise similar patterns of use and mis-use in themselves as they develop their observational skills and awareness. As some of the experiential exercises used in workshops are in the form of games, it can also be a fun way to learn. The courses and workshops that I run are for a maximum of six participants so that each person can experience some individual hands-on work, although the time available for this is much reduced compared to private lessons. However, it does encourage people to take responsibility for their learning so that they do not immediately become dependent on the teacher and wait to be made to 'feel better'. With larger groups, it is not possible to give much hands-on time at all, if there is only one teacher. In order to address this problem, some teachers, myself included, are developing links with Alexander Technique Training Schools and are inviting senior students and graduates to assist on Introductory Courses and Workshops. This allows course participants much more hands-on time and more varied discussion, plus offers trainees some valuable experience of working with groups of beginners. This enriches the courses and is beneficial for everyone involved. So, although it is ideal to learn the Alexander Technique through individual lessons, a group course - used as an adjunct to these - can in my opinion, offer some useful extras which can enhance a pupil's learning. Pupils benefit by getting to know others who are interested in the Technique and this contact can be supportive of their learning and their application of the Technique in everyday activities, so that their learning does not remain something that only happens in lessons. For many people, a group course leads them into taking 1:1 lessons, so they end up by benefiting from both ways of learning the Alexander Technique. I have noticed over the years that pupils who take 1:1 lessons and who know others with whom they can discuss issues to do with the Alexander Technique, often become more engaged with applying AT work in their ordinary, daily lives, than some pupils who don't see other people around them using the Technique. This is a very good argument for including at least some group work as part of the learning process.